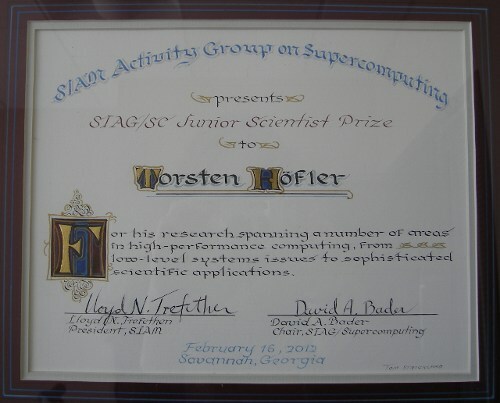 The SIAM Activity Group on Supercomputing (SIAG/SC) Junior Scientist Prize, established in 2009, is awarded to an outstanding junior researcher in the field of algorithms research and development for parallel scientific and engineering computing, for distinguished contributions to the field in the three calendar years prior to the year of the award. 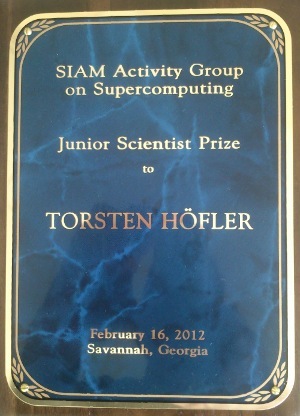 I was invited to the biannual SIAM-PP (Parallel Processing) conference to give a plenary award lecture. 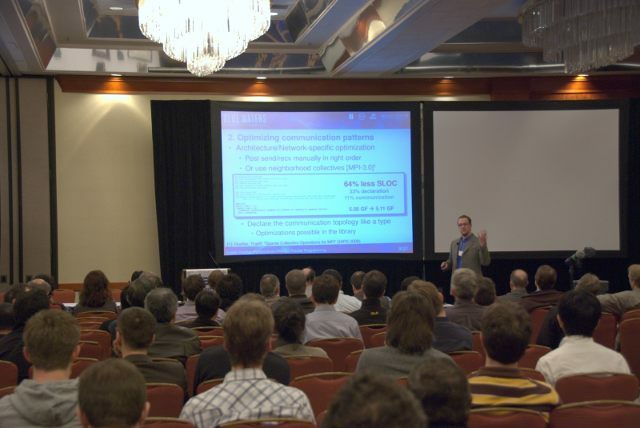 I talked about an holistic approach for optimization of parallel codes, similarly to optimizations in serial codes. I hope we will soon be able to automate this process for parallel (at least MPI?) codes! The presentation is archived at https://live.blueskybroadcast.com/bsb/client/CL_DEFAULT.asp?Client=975312&PCAT=4072&CAT=4075 . I am obviously very happy that I was selected as the 2012 recipient and want to thank everybody who worked with me (and contributed in this way) in the last years. It was an amazing experience to work with Andrew and colleagues in the Open Systems Lab (now CREST), it certainly widened my horizon significantly. Also, Andrew supported me always pursuing crazy and not so crazy ideas and the freedom I had was unseen. I was almost sad when I had to leave for UIUC, but everybody has to go (temporarily in case of OSL ) but there was just no way to argue with or resist Marc Snir (if you know him, you know what I am talking about). I am extremely thankful for the many afternoons Marc spent with me talking about parallel computing and providing amazing insights into the background or “structure” of the problems. I am so happy to be able to work with him. And being at UIUC, Bill Gropp provided me a huge amount of guidance advice (professionally as well as personally) and opportunities to collaborate. I also enjoyed (and enjoy now even more!) the guidance of Bill Kramer in terms of management abilities and problem solving. It’s simply an amazing environment! The talk was well attended even though it was after 7pm . 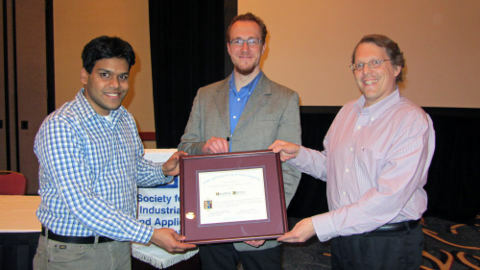 Kamesh Madduri and David Bader presented me the award. Here are some updates from the March MPI Forum. We decided that the door has closed for new proposals, so MPI-3.0 could be ratified in the December meeting if everything goes well! Otherwise, we made huge progress on many small things. Many readings and votes on minor tickets and the results can be found here. The most interesting proposals for me were #284 (Allocate a shared memory window), #286 (Noncollective Communicator Creation), and #168 (Nonblocking Communicator Duplication), which all passed their first vote. The Fortran bindings ticket #229 passed it’s second vote! Scalable vector collectives (#264) were postponed to the next MPI version because the Forum felt that they would need more investigation of several alternative options. I explained those and other interesting tickets in my last post on MPI-3.0. We also made substantial progress on Fault Tolerance (which remains a controversial topic for several reasons) and a lot of cleanup (thanks Rolf!). The next meeting in Japan will be exciting!